Every March, hundreds of brass bands from all over the country compete in regional championships. 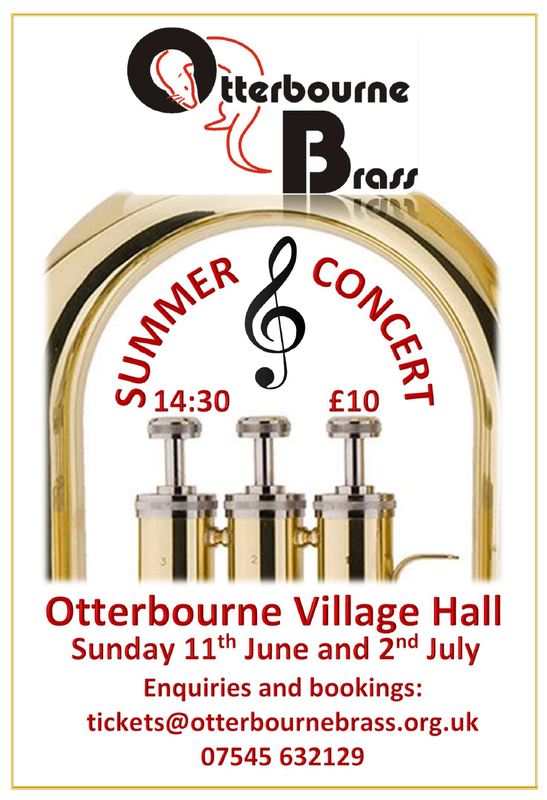 Otterbourne Brass, like all the brass bands in Hampshire, have a long trek to Torquay where we compete in the West of England regional qualifiers. In 2016 Otterbourne did very well and came 2nd and so we qualified for the National Finals. Great excitement all round! So, in September, the band competed in the Second Section national finals in Cheltenham, where we came a creditable 5th, and interestingly, were the highest ranked 2nd section band south of the Watford Gap. As a result of our success in the last 2 years, we will once again be competing in the 1st Section from 2018. Preparations for March 2018 have already started. In between carols and Christmas music, the band has started rehearsing the test piece “Brass Metamorphosis” by James Curnow. In the banding world, it’s not well-known, however, it makes an excellent test piece: the music is technically challenging in places, and will take an experienced conductor to get the most out of the music. 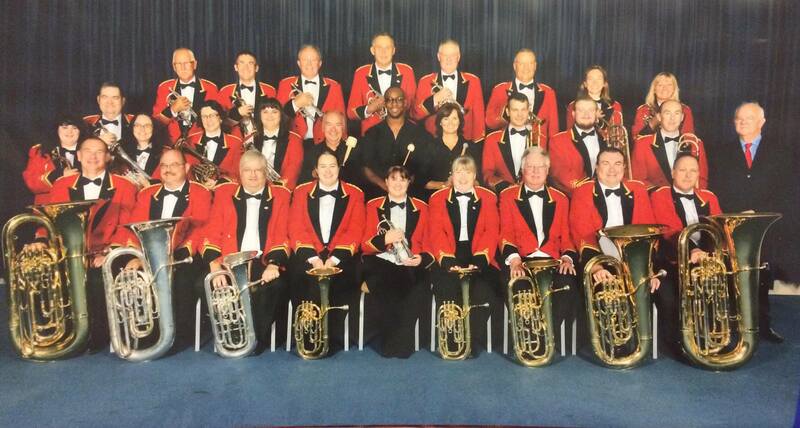 Otterbourne Brass at the National Brass Band Championships of Great Britain, 2nd Section Finals, placing 5th. Sunday 25th September saw us travel to The Hawth in Crawley to take part in the annual SCABA Autumn Contest. We were competing in the first section against a number of bands from the South of England. We had chosen to play “The Saga of Haakon the Good” by Philip Sparke and rehearsals leading up to the performance had been enthusiastically attended. Confidence was high and this was reflected in an immense performance on stage which 4 Bars Rest described as “a wonderful blood curdling rendition”. The audience gave us a resounding reception, although at the time we were uncertain whether this was in appreciation of our performance or the fact that Melvin, our MD, had chosen to don a Viking helmet complete with horns at the conclusion of the piece. Fortunately, the adjudicator, Denis Wilby, shared the views of the audience and awarded us 1st place, beating off stiff competition from Horsham Band. Melvin White, our MD, was awarded the prize for Best Conductor and Graham Jones, our principal euphonium player, won the prize for the Best Euphonium. By all accounts, a successful day plundering prizes in Sussex – Haakon would have approved! After a great push towards the Area contest in March and a fantastic result, we at band look forward to a short period of relaxation over Easter, when some of the band are off on holiday and spending time with family. Sadly, this year we said goodbye to 2 of our younger members of the band. Principal cornet, Sonja Charters’ daughter, Becca, left us a few months ago to further her experience by joining a local championship band before heading off to music college in September and Tom Toledo-Brown decided to take a break from brass banding to concentrate on his studies before sitting his GCSEs in May this year. Becca is still a regular face in the band room as a fantastic dep and Tom is hoping to return once his exams are out of the way. This week sees Becca return as a solo cornet for her 3rd course and Tom attend his first course on 2nd cornet at the National Youth Brass Band of Great Britain. A massive achievement for both players and we are very proud of them both. NYBBGB is made up of around 80 of the best players from around the country who have been auditioned and those lucky (super-talented) ones, offered a place in the band for that year. Every Easter and Summer members are invited to attend a week long course together. They practise extremely hard all week in both full band rehearsals and sectionals taken by some of the top players in the country. This course sees Becca being tutored by Philip Cobb, principal trumpet of the LSO since he was 21 and Tom being tutored by Tom Hutchinson, principal cornet of Cory Band – currently the best brass band in the world. Both ex-principal cornets of the NYBBGB during their time with the band. All the tutors provide such a wealth of experience and inspire the youngsters so much during their time together, albeit short. They come away not only having had the best time together, but making lifelong friends and becoming better musicians too. I’m sure you will agree, what an important role this plays in the continuing future of brass banding in this Country. At the end of the course, the band usually perform two concerts locally. This course’s concerts are scheduled for 14th April at Uppingham School and 15th April at West Road Concert Hall in Cambridge. 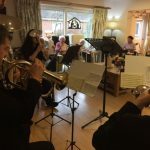 This year the members also have an extra special treat of being invited to play a concert a week later on the 22nd April at the Barbican Centre in London. All concerts prove to be something special as the band play a whole new repertoire which they have perfected in just a week and as always they play to an exceptional standard and also showcase spectacular soloists, this course being Philip Cobb on cornet and Peter Moore on trombone. If you can manage to get across country to attend one of the concerts, you will not be disappointed. They are well worth the trip. But, if you are unable to travel, please consider supporting the future of the brass band culture in the UK and check out the NYBBGB website and or Facebook page and have a look at the good work the band does and what the youngsters are getting up to each day. I’m sure you will all be as excited and proud of them as we are at Otterbourne. Tickets for all concerts can be purchased via links on both pages. John shaped the lives of so many people, and I had nothing but huge respect and admiration for him. I absolutely lived for my Saturday morning rehearsals at Westgate school in Winchester, travelling all the way from Whitehill. I remember feeling rather scared when I moved up to the concert band and was seated right in front of the legendary Mr Knight on 3rd cornet! He was such a perfectionist. Band was literally my life from age 9-19. There were so many wonderful times, and I made friends who are still my closest friends today. Christmas Eve isn’t Christmas Eve to me until I’ve been to the Buttercross in Winchester and heard the current band playing, and I always see lots of familiar faces, ex Hampshire County Youth Band members and their parents sometimes. We were one big happy family. 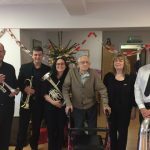 I had the privilege of playing carols at Aldbourne Nursing Home on 19th December with a few friends I made as a teenager (one of them who I still call my “big brother”) and John enjoyed singing along – although mentioning how Gladys would have also enjoyed it, which I found heart breaking, having attended her funeral in September. He could still recall names of test pieces and composers and even stood for some photos with us, which meant the world to me. I remember something he said when I was probably about 13/14. He said that music will always be in your bones even if you don’t continue playing…and he was right. I did have a rather long ‘break’ but have been banding again for the past 4 years (almost) and just love it. Thank you Mr Knight, for your mentoring and bringing so much inspiration and happiness to so many people’s lives. I have memories that I will treasure, always. John’s funeral has been arranged for family and close friends only but a Memorial Tribute will be held at Winchester Guildhall on Sunday 2nd April 2017. Contact: ray@raybulpit.co.uk or call 01264 352560 for more information. In addition to the Christmas Concerts, the band performed in several locations in order to collect funds. Without these carolling gigs, we would not be able to afford music, instruments and, more importantly, we wouldn’t have Melvin as our conductor. Tesco Winnall and Brambridge Garden Centre, for whom we were due to play but which unfortunately fell through. We also played at the Buttercross on Winchester High Street. We’d also like to thank our annual engagements with Bitterne Conservative Club and Alton Masonic Centre, and a first-time carolling service with South Wonston WI. 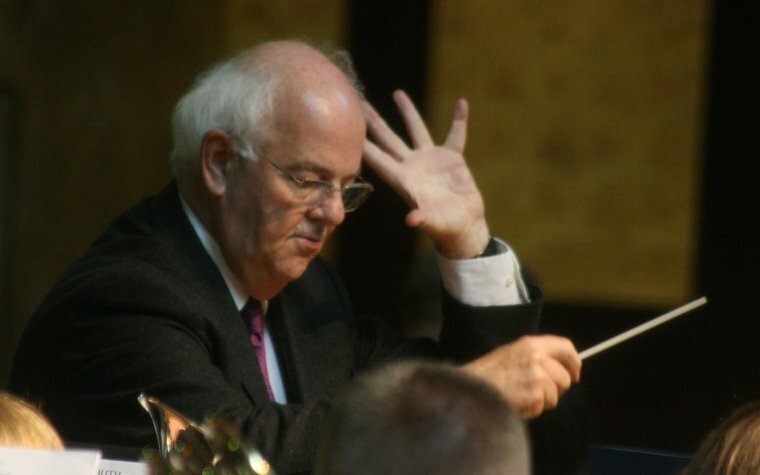 Finally, thank you to the hard work and dedication of members of the band, a handful of which can boast having played at almost every session – of which there were a grand total of 19. Some had over 30 hours of carolling under their belt! Thank you to everyone that donated during this period, and we look forward to carolling again next year. Although somewhat belated, we love to keep our fans up-to-date with our activities, and Christmas is our busiest period. Read on for more! The now traditional Otterbourne Christmas concert weekend was once again a highlight of the Band’s busy Christmas schedule. Both the afternoon and evening concerts were very well supported and the audience enjoyed a varied programme of Christmas music, which included many different arrangements to traditional and well known Christmas tunes. One particular highlight was the The Huron Carol, a traditional Canadian Carol probably written in 1642, arranged as a Cornet Solo, and played superbly by Sonja Charters, the Band’s Principal Cornet. For a little variety the concert programme also included some non-Festive pieces that were associated with “tunes from the Radio”, such as the theme tune from Desert Island Discs (“Sleepy Lagoon”), which proved to be very popular with the audience. Another highlight was Goldcrest, a march the Band played at the recent Wessex Contest, which included a section requiring the Band to sing – a first…. At the end of the concerts the audience departed with smiles and “thank you’s”, confirmation that performances were much enjoyed and appreciated. As always, the concerts could not have happened without the hard work of the Band, the Committee and everybody who helped to organise the events. And not to be forgotten, Paul Chapman and Melvin White the MD’s for the concerts. Sunday saw the band making its annual appearance at the Otterbourne Village Fete, an event which is enjoyed by band members young and old. The threatened rain fortuitously held off until we had finished playing and we were able to entertain visitors to the show with a varied selection of music from the Second Waltz of Shostakovich’s Jazz Suite to the sublime delights of Frozen. The day started in its traditional way with a parade of home made jalopies (including a Dalek made entirely of lego!) driving through the village to the fete ground. Here, they were greeted in front of a large and enthusiastic audience by the band who played a couple of rousing marches by way of welcome. 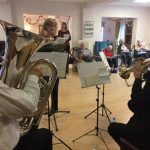 Solo items included Stardust played by guest trombonist Sue, and An Untold Story performed by Berni on tenor horn. Both solos featured playing of the highest quality and we are fortunate that the band has such talented players. Particular thanks have to go to euphonium player Will Wilkins, who stepped in at short notice to conduct the band for most of the first half. Melvin White, our musical director, was delayed on the M3 but managed to join us in time for the ice creams and cake during the break! Thank you to our deps: Meg, Billy, Paddy, Mark, Ben, Sue and our regular guest Ken on bass trombone. Our thanks are also sent to the organisers for another wonderful fete and we look forward to returning next year.